I normally don’t get into stories from the suburbs around here, but you’ll have to excuse me – I’m a SUCKER for headless ghosts. Over on another blog I’ve reviewed several variations of Legend of Sleepy Hollow. Sheridan Road used to be known as a real hotspot for ghosts – occasionally local papers would run features on all the murder sites and haunted spots you would see driving along it; it even put you in spitting distance of H.H. Holmes’ place in Wilmette, and one story told a lurid tale of a woman finding a skeleton buried near there after having a dream about someone being buried in the woods (more on this later – I’ll check into it). But chief among these was stretch of Hubbard’s Woods near the ravines that was haunted by a headless man. As of 1902, the latest of the articles, residents still remembered the “headless horror” of 1881, when a headless corpse was found in the woods. Local legend had it that every night, on the anniversary of the murder, the headless ghost would wander through the woods, searching for its head. In may, 1881, a twelve-year-old boy was going hunting for birds’ nests in the woods when he came upon a headless corpse about fifty feet north of Green Bay Road. It was leaning as though the head “must have rested upon the swelling base of the tree as upon a pillow,” and would have been face up, except, well, there was no face. The head was nowhere to be seen. The pockets had been turned inside out, suggesting a robbery. THe head-chopping was so cleanly done that some thought that a machine must have been used, like a guillotine. A bearded human head had been found upon the lake shore about six weeks prior, in a direct line from where the corpse had been found. Clues came in fairly quickly. Cards from a hotel in BRemen, Germany were in the pockets. A new search of the area where the head had been seen yielded a high-crowned black derby hat with some human hair and blood in it. The clothing had bit slit lengthwise, as though the killer had intended to strip it all off, but then got nervous and left it. There were signs of a terrific struggle. The city had the body buried in a shallow grave near the tree where it was found (to the consternation of residents), then hastily dug up to see if it could be matched to a body-less head that was exhumed from Dunning (I couldn’t tell if this was the same head that had been found on the beach, which some reports say had washed away). When dug up, the body was no more than three feet down, and in a pool of stagnant water. The smell was about as one would expect, and the corpse, though only just buried, was barely recognizable as anything that had ever been human. The head, too, was in bad shape, but was found to be a reasonably good match – close enough, anyway. The two articles were put into one box and taken out to Dunning. For a time the body was said to be that of Bernhard Polzig, but checking on the origin of the clothes yielded a theory that it was a missing Bohemian man named Ignaz Hopf, who had recently fled Bremen and was probably murdered in March, only weeks after arriving in the United States. Who killed him, and exactly why, were never exactly determined. 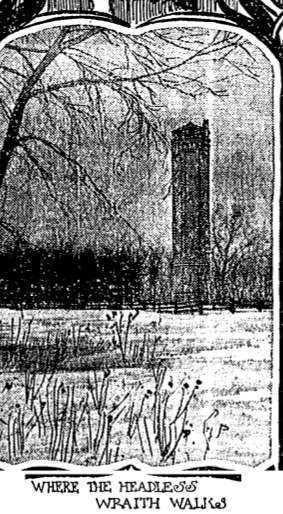 In the 1890s and early 1900s, the Trib occasionaly made mention of the belief among the locals that the headless ghost walked around the ravine, at least on the anniversary of the murder, looking for its head. Whether they actually believed this, and if anyone actually claimed to see it, were not mentioned. By the time these stories came out, the way the story was being retold differed a bit from the way it actually happened; in the retellings people usually said that a bunch of boys found the head after the body was found.